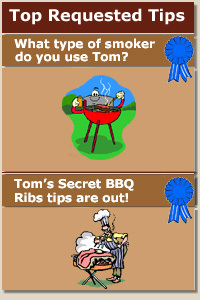 Lots of people have been asking me about the type of barbeque or smoker that I use. The truth is that you can get great results with many different types of grills or smokers and very bad results with others. For good old-fashioned slow cook barbeque you need constant indirect, uniform heat, (about 200 degrees F) over a long period of time. You also need moisture and a source of smoke for flavor. So what do I use? I use an electric smoker, slightly modified of course. I used to use a large cast iron barrel smoker with a separate firebox, but it is just a lot of work and when I do ribs, I want to relax, have a couple of beers and have fun. I live on a hundred acres bordering the Ocala National Forest and in a half hour I can cut more fresh hickory or oak wood than I can use, but why should I. My smoker is quick, easy and gives me the best results of all the smokers or grills I’ve used, and it’s a no-brainer. I also use this smoker combination to cold-smoke seafood like salmon or shrimp. So what is it? I use a Brinkman® electric smoker with a Smoke Pistol tm. These two components are not made by the same company, but they should be. They make a great combination. The Brinkman® electric smoker has an electric coil surrounded by lava rock which gives a continuous uniform heat. Above the electric coil is a steel pan, which is filled with water. This provides the moisture, helps keep the temperature constant and the heat indirect. It is large enough to handle three large slabs of ribs and a few throw-downs. (appetizers, for you slickers) CharBroil® makes a similar unit that has a thermostatically controlled heat coil and a thermometer in the top. The only problem with these units is that they don’t smoke. The manufacturers tell you to put wood chips by the electric coil but if you believe that, you’ll be adding wood chips every 10 minutes and getting sporadic smoke at best. That’s why I added a little thing I found on the Internet called the Smoke Pistol tm. The Smoke Pistol tm is a little smoke generator with a great smoke output. This little patented device can be added to anything from a large smoke house to a barbeque grill to provide a constant, continuous and controllable source of smoke. There are little, easy to light, wood cartridges that are about the size of stick and they put out more smoke than three large logs. The trick is the way they are burned but the nice thing is that the amount of smoke is controllable. Yea, there is a little dial on the unit that lets you set it for more or less smoke. I happen to have quick and easy access to all the hickory, oak and other hard woods I can use but it is still a whole lot easier, and less wasteful, to use one or two Smoke Pistol tm cartridges than 6 to 10 logs. You can also try some of the other wood flavors that aren’t native to your area like mesquite and I recommend alder. (Alder is a wood from the northwest with a great flavor). The only problem with the unit is that sometimes you need to tap on the side of it if the smoke slows down. I usually set the thing to low, just so that it is blowing out just a little smoke. You can send out enough smoke to fill a large smoke house with it but you don’t need a lot of smoke to add flavor. After you put together your Brinkman® smoker and add the Smoke Pistol tm (it takes about 15 min to put together the smoker and 5 min to add the Smoke Pistol tm ) you’re ready to do great barbeque ribs with little effort. So that’s the smoker that I use and the whole thing will set you back less than $100. Now check out my slow cook ribs recipe and be the bbq pro on your block.